The snow storm that hit Tuesday evening was the largest we’ve had in several years. It left a foot of snow on the ground in the Ridgefield area, closed schools and public offices, and with the continued cold will likely last until midweek next week. 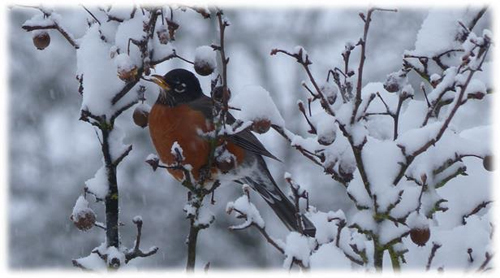 The photo above is of a robin eating fruits from a tree on Pioneer Street. These fruits have been available for several months and are only now being eaten. It suggests that they are only being eaten because the birds have little choice. It’s the same thing with berries on holly trees. During prolonged periods of cold with snow on the ground some holly bushes in Ridgefield have been stripped of their berries. The fruits may not have the nutritional value that more available foods may have. Fruits remaining on trees can ferment after the first frost and become toxic. Deep snow means a challenge to wildlife that cannot forage for food on the ground. Robins eat fruit but also worms, insects, and spiders. Robins don’t feed from bird feeders but will take food scattered on the ground. The Audubon society recommends putting out foods such as chopped apples, grapes, and raisins. They will take meal worms that can be purchased in pet stores as well. Since the deep snow and cold are going to last for a time, it makes sense to help wildlife by putting out food for them. Scott and Kathy Hughes have food for birds and squirrels at the hardware store and Petco has mealworms. Robins and other birds need a water source to drink and bathe so if it’s not too cold a birdbath can provide water. An upside down garbage can lid filled with water works as temporary birdbath.